Optical switch is a switch that enables signals in optical fibers or integrated optical circuits (IOCs) to be selectively switched from one circuit to another. It is widely used in optical switching, configuration optical add/drop multoplexer(OADM), optical fiber ring protection and optical cross and connection system. 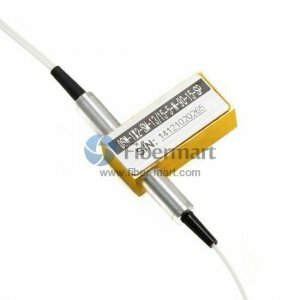 Fiber optical switch is one of the main factors to affect the optical performance of the network, it is the key device to realize optical networking network. Currently, Fiber-Mart produces four series of optical switches, including opto-mechanical optical switch, MEMS optical switch, solid-state optical switch, rackmount & benchtop optical switch. Switch type as 1x1, 1x2, 1x4, 1x8, 2x2 as well as dual 1x2 and 2x2 bypass for single mode fibers, multi-mode fibers, non-latching and latching are available. And 1xN rackmount and benchtop optical switches are ideal for high-volume manufacturing production testing.